I’d always heard that, off-stage, Bruce Springsteen is a very normal sort of person. Meaning that the uninhibited, propulsive sides of his personality are reserved for those many moments when he stands beneath spotlights. Yes, everybody knows that in concert he rocks and rolls like few mortals ever have, sweating up storms of great magnitude while giving it all he has. And now I can attest to the truth of this paragraph’s first sentence too, because last week I met The Boss. At my house, no less. He’s a good guy. 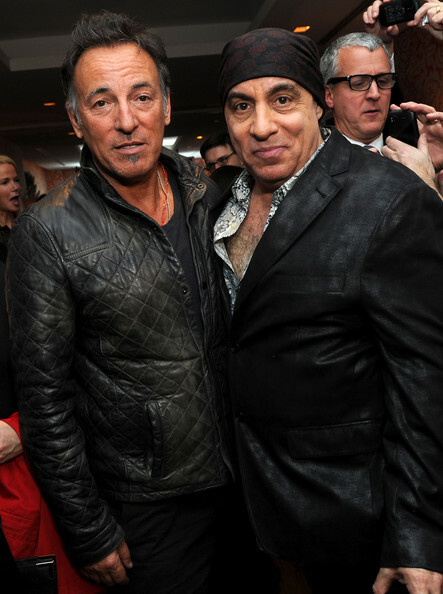 As is his buddy Steven Van Zandt, a guitar slinger who has been a member of Springsteen’s E Street Band for many years. I didn’t know that they were planning to visit me. I’d have put on something more flattering than a Donald Duck tee shirt and a pair of candy-striped shorts if I had. Whatever, as they say. The main thing is that it’s a good thing I was home when they knocked on my suburban Philadelphia front door yesterday afternoon. “Gentlemen, enter!” I said, bowing and sweeping my right hand in a dramatic, welcoming arc. Enter they did, Bruce quickly spotting the ground floor john and heading towards it pronto. Stevie and I shook hands and took seats in the living room. I stared at him in disbelief. He smiled that smile of his that’s wide as a canyon. “Stevie, what do you want to drink?” I finally managed to ask. Two minutes later I strode into the living room with a big tray that held glasses of fizzy water and bowls of pretzels and chips. I looked at Bruce, who had finished his business and taken a seat on the sofa, and at Stevie. We lifted the glasses to our lips and reached into the bowls. At that moment Sandy, my wife, turned her key in the front door lock and entered our house. She had been out shopping for some Matisse-inspired toilet seat covers. Sadly, none were to be found. Bruce and Steven rose, fine gentlemen that they are, when she came into the living room. Not unexpectedly, her jaw dropped not only into the basement but through the basement floor itself. Well, Bruce and Steven hung around Sandy’s and my house for a few more hours. We all got on famously. Like I said, they are good guys. Very good guys. Bruce and the band are taking a break from the road right now, but plans for the next round are in the works. Rehearsals and touring start early next year. Sandy will fly to be with me now and then, like when the band is in London and Amsterdam and Stockholm. I’m psyched about what’s ahead. This is the damndest thing, isn’t it? Me, a schlub who gets yanked from behind a computer keyboard to become a cog in one of the most popular bands in the universe. You know, I’m awake, but pinch me anyway. I won’t mind in the least. BTW good luck with the Springsteen thing. I’ll spend a few hours today practicing the triangle. I’m getting ready! Watch out for that very important ‘ting’ halfway through Thunder Road. “I want you to play the triangle”. I don’t know what to say. That’s one of the best lines I’ve ever heard. Thanks, CB. I appreciate it. Wow, first Keith Richards and his wife and now Bruce and Stevie – You are very well connected aren’t you?! I’ll have to write a post myself about losing my mojo for rock music and who knows, I may end with some of my heroes inviting me on tour – I may not be able to sing that well or play an instrument but there is always a need for a super-summary dancing type person on stage. Heck why just stick with the triangle, go for broke with a tambourine! Yes, the tambourine is a must! Of course that should have been “supernumerary” dancing type person (grrr… predictive text). Also meant to say excellent and very funny post – You are on form this week! And you might want to learn the cowbell, too–it’s easy, and, who knows, if your next visitors are the guys from Blue Oyster Cult, you’ll be ready to rock’n’roll! Thanks, Cindy. The cowbell idea is a good one. I’ll run it by Bruce. Thanks for dropping by. Looks like I need to get my cowbell act together. Jerry, I’ll do my best to get you free tix. Neil, I think you’ll have to put in some effort on the sartorial side if you’re touring with the Boss. I mean, candy-striped shorts won’t cut it. On the other hand, you’ll have to think practical, too: Springsteen’s work ethic is legendary, so I imagine his interpretation of a little light block-pounding is going to leave you drenched in sweat. Pack plenty of spares, and check out the laundry arrangements in advance. I see these as priorities. Andrew, I knew I could rely on you for good advice. Thanks very much. You know you’ve given me heart. My frog might yet turn into a prince! Well, if you need a helper… someone to plane your wooden blocks or polish your triangle… I’m your man! I mean… those blocks would need a lot of attention to stay tuned… and you being worn out after sweating buckets full every show… I’m your man! Bang on man… bang on! I’m your man! PS – Did I mention I’m your man?? I’m glad you liked this story. You know, I’d guess that Bruce would get a couple of laughs too in the incredibly unlikely event that he saw this piece one day. Wait . . . I hear a knock on my front door. Could it be . . . ? Hahaha! You have a wonderful imagination! Watch out for headhunters! LOL! Great Story. I lost my obsession for music in 1977. The last concert I attended was Peter Gabriel at the Capitol Theater in Passaic NJ. I didn’t regain real interest until the 1990’s. During that drought I only was interested in Springsteen, Stevie Ray Vaughn, Robert Cray, U2, and a few other artists. Hello. Thanks a lot for adding your thoughts. The acts you kept up with during your drought are good ones. Lots of good music there. Thanks for reading my stuff, Muriel. I appreciate it. You forgot to mention to Bruce that you read his book, Born to Run. Next time you see him, don’t forget to do that. It might get you a mention in his next book, which I’m sure is on the way. Bruce is an amazing talent,as everyone knows. He didn’t use a ghostwriter for his book. And it got great reviews overall. It’s a sad day in America when a gal can’t even find Matisse-inspired toilet seat covers. Congrats, Neil! What an amazing story. It inspires me to write a post about being tired of acting (though I only did a year of dinner theater), and somehow getting it to Amy Adams’ fan site. I like living in a fantasy world. Sometimes, anyway. Thanks, Dianne. I appreciate that. I am a HUGE fan of Springsteen and the E Street band, so I really, really hope it’s real. 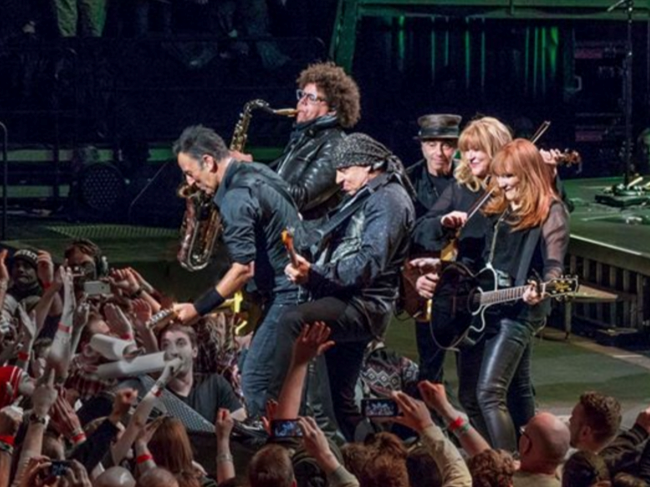 This is what I wrote about the latest Springsteen concert I attended (River Tour). And about his amazing memoir. Both of my posts are in French because this is when I lived in France that I heard Springsteen first. I owe him my first elements of knowledge of the US, years before I moved there. I only saw him four times in concert but his music is in my car, on my phone and mostly in my head and heart. In any case, thank you for this incredible post. Glad you liked this story. Ah, if only it were true . . .